Congratulations to ThinkGenetic Advocacy Partner, cureCADASIL, who received a donation of $500 from ThinkGenetic. The donation amount was based on converted ThinkPoints, which ThinkGenetic users accrued in August 2017. The donation to cureCADASIL marks the first in a monthly series in ThinkGenetic’s ThinkPoints program. Registered ThinkGenetic.com users earn ThinkPoints for performing different activities throughout the website, such as sharing their story or providing feedback. These ThinkPoints can then be donated to one of 31 ThinkGenetic Advocacy Partners. The goal of the ThinkPoints program is to help fund research and support advocacy groups with their work that impacts the genetic disease community. 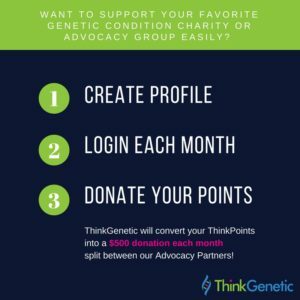 Each month a $500 donation will be split between ThinkGenetic Advocacy Partners, based on the number of ThinkPoints that registered ThinkGenetic.com users allotted to them. The more ThinkPoints that are assigned, the higher the percentage of the total donation that an advocacy group will receive. Genetic condition advocacy organizations and charities can enroll in the ThinkGenetic Advocacy Partner Program by contacting advocacy@thinkgenetic.com.